The most important piece of motorcycle equipment you will ever purchase is a good helmet. And with that obvious statement, qualifying what good really means is admittedly less evident. It is not always easy to determine what drives helmet pricing, or if all helmets offer the same level of protection. What is it you are paying for exactly, and how does one select the best helmet for their individual needs? As the saying goes, safety first, so we’ll start there. All quality helmets sold throughout the world carry one or two different safety ratings. The first rating is often mandated by the governing agency where the helmet is sold and used. These are required by law as applied by a state or country and the certification is provided by a third party. You will recognize these certifications as labeled by DOT in the United States, ECE 22.05 in Europe and AUS 1698-2006 in Australia. These organizations set certification standards which are based on voluntary guidelines. It does not imply that these helmets have surpassed any rigorous testing protocols. Most helmets will be tested by the above agencies eventually, but the manufacturer is only required to adhere to their defined standards, not prove that they meet or exceed them. If however, a helmet carries certification from SNELL or SHARP, those helmets have undergone a full battery of tests. There are a lot of debates about which certification carries the best measurement of protection. Many argue the testing protocols for ECE and SHARP are the most comprehensive, but such claims remain subjective. If you look at the back of your helmet, see any of the above stickers announcing their certification, suffice it to say your head will be protected. Part of good fitment is making sure the face aperture affords unobstructed visibility. That includes when the visor is pushed up as well. No helmet is worth the box it came in if it doesn’t fit. While many companies offer helmets designed to accommodate a variety of head shapes, most manufacturers have to effectively pick a head shape they want to champion, then go from there. The industry has somewhat decided on three general shapes which are: oval, semi-oval, and round. This relates to the shape of the circumference of the user’s head. Matching head shape to helmet shape is critical and you really can’t fake it if you chose a helmet that doesn’t suit your head. Many of the upper echelon helmets will offer some modest adjustability, particularly with the cheek pads. Arai’s XD4 helmet has cheek pads which can be modified by removing precut layers of foam to fine tune the fit. There are other nuanced elements of fit such as the depth of the helmet and where the upper portion of the face aperture aligns with the user’s field of vision. Where the chin strap interfaces with the user’s neck can sometimes present a problem and other internal elements can create pressure points or empty voids. Cheaper helmets may also use as few as two or three shells to facilitate up to five or even six actual sizes. Premium helmets may offer a unique shell size per actual size for an optimal fit for the end user. That typically correlates with higher prices. One last word about fit, the liners in most helmets will compress over time, if slightly. The pronounced features of the Icon Variant do add to wind noise and increase the overall size of the helmet as it pushes through the air. One of the worst things to plague a helmet is wind noise, particularly on long mulit-day rides. Wind noise cannot only be an annoying distraction, it can irreversibly damage your hearing. Earplugs are always a smart idea, even on a quiet motorcycle, but the aeroacoustics of a helmet are extremely important. Schuberth is so committed to aerodynamics and aeroacoustics they remain the only manufacturer with their own wind tunnel. 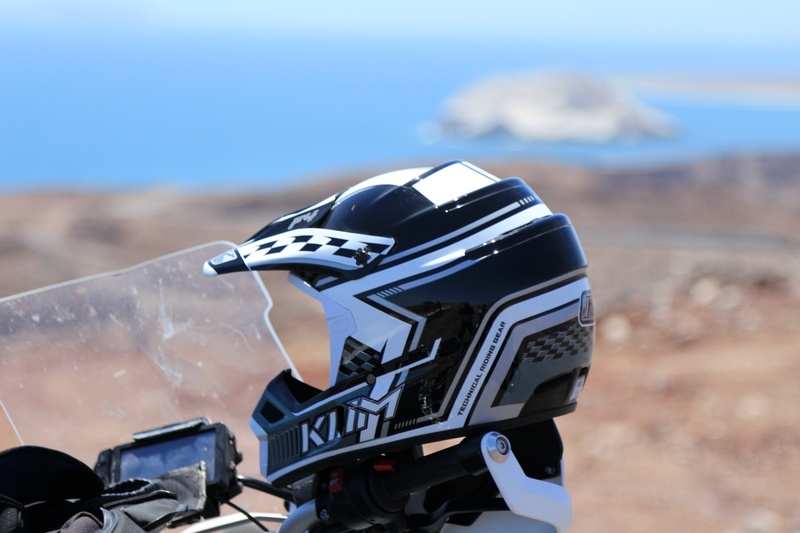 Klim’s unique vent channels ring the upper third of the helmet in three defined steps. 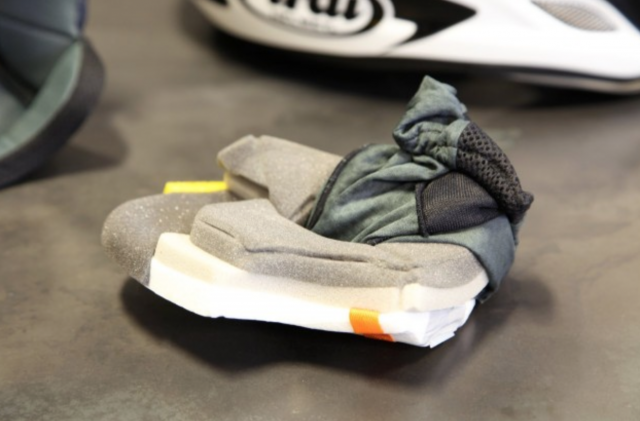 This allows for hot air to be expelled from the helmet even at low speeds. It is also extremely light. Stick your head in one of these tight fitting orbs with no way to import or export air and you will feel the effects of claustrophobia instantly. Ventilation not only keeps your head cool, it helps expel moisture and if nothing else, the stuffy air swirling around your face. The key to good ventilation is relative to the placement of the vents and how well they move air without creating wind noise. Those vents also need to be easily manipulated with gloved hands to open or close them accordingly. As a bonus, when weather strikes, these vents should shut out water as best as possible. Cold rain rolling over your scalp and down your neck is its own form of water torture. The rear exhaust vents on the XD4 are easily actuated with gloved hands and export large amounts of air. All helmets are not designed with the same objectives. 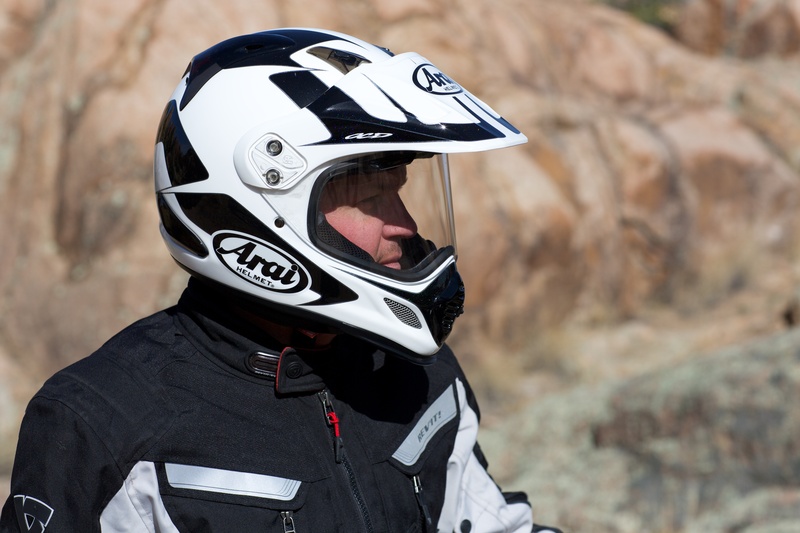 There are helmets designed primarily for road use, some for off-road riding, and a mix of helmets in between. 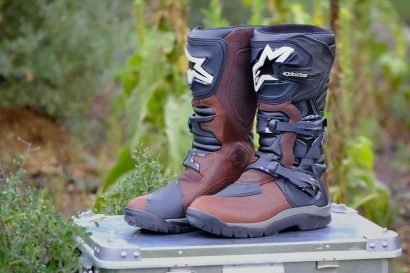 While some helmets achieve good crossover, picking the helmet designed for your particular style of riding is probably best. For most adventure riders, the growing crop of dual-sport or adventure helmets are often the most attractive options. They include a large peak visor to block out harsh sunlight, have a wide face aperture for optimal visibility, and most noticeably, a protruding chin bar for maximum protection in the event of a get-off in technical terrain. 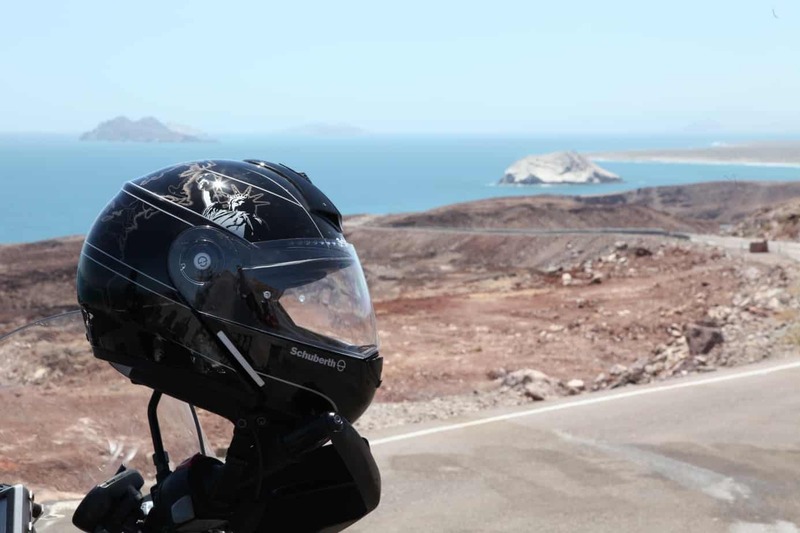 While many of the better dual-sport helmets offer good aerodynamics at speed, that large peak visor and elongated chin bar can become fatiguing elements after a long day in the saddle at highway speeds. This is highly dependent on the particular helmet. Some dual-sport helmets cut through the air quite well. Many lower quality helmets can be downright scary at speed as they conspire to remove your head from your neck. 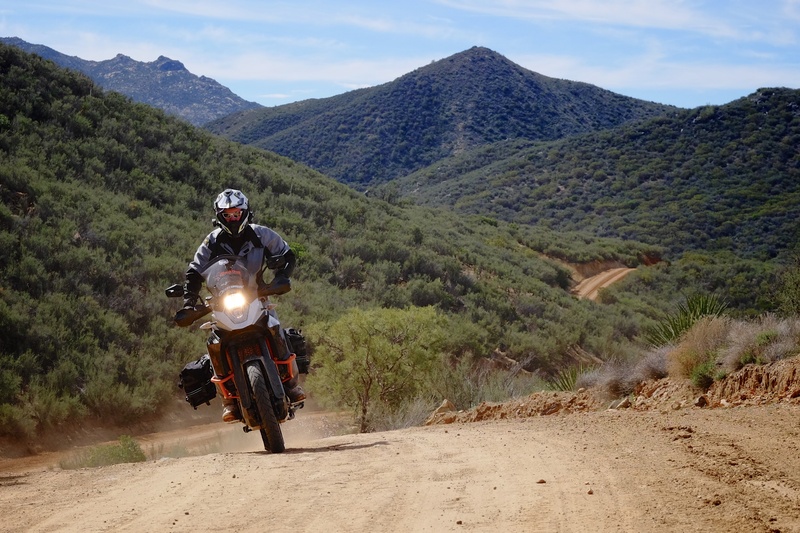 Modular helmets have long been favored for touring riders and continue to be popular for adventure riders. 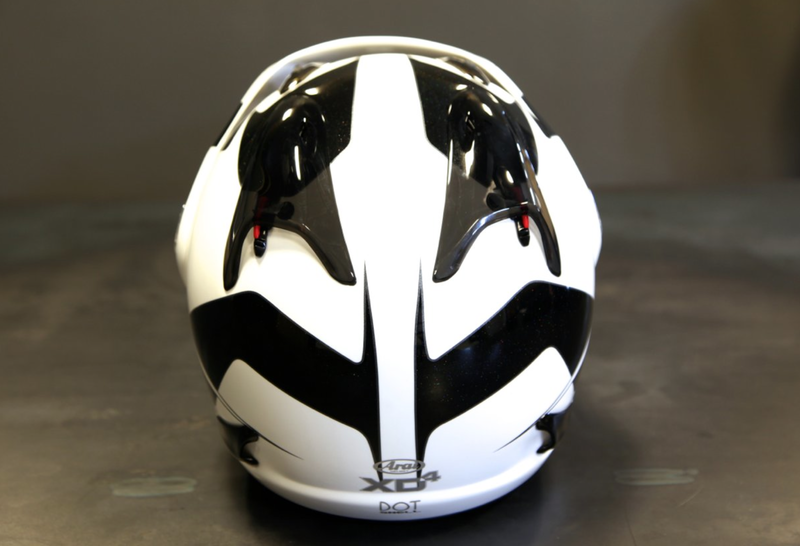 The ability to quickly and easily open the entire face of the helmet has obvious advantages. 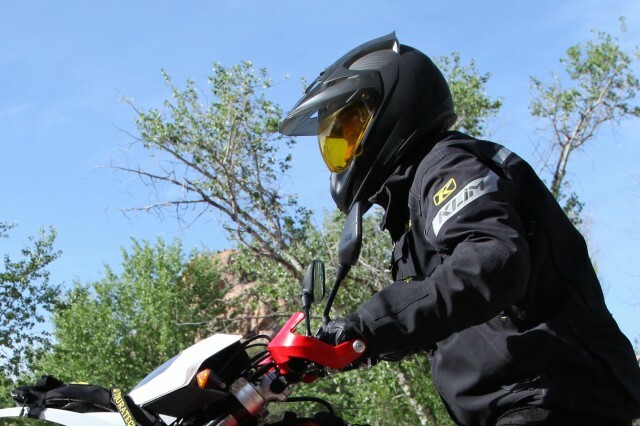 It instantly cools the helmet when stopped, allows for easy communications to other riders without the complete removal of the helmet, and makes reading maps and GPS units easier. All of this whilst stopped, mind you. Photographers also like the ability to stop, flip up the chin bar and pull their camera to their face without obstructions. A significant portion of the comfort equation is relative to weight and aerodynamics. If a helmet is heavy or prone to buffeting and drag at higher speeds, the toll it can take on a rider’s neck is significant and enough to shorten some riding days. A carbon fiber helmet will usually be much lighter than a fiberglass helmet, but come at a premium. Those helmets with stylized visors and spoilers may look great, but those additions can create uncomfortable aerodynamic properties and induce fatigue. This is a tough set of criteria by which to judge any helmet. Some features can be gimmicky, while others truly useful. They can be simple things like a quick release chin strap buckle, something genuinely appreciated with every use. 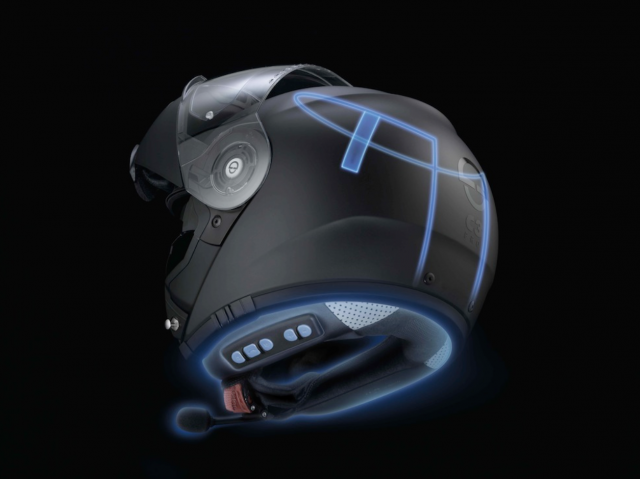 Other features might include drop-down shaded shields for relief from harsh light, inserts to reduce fogging, or even the ability to seamlessly add communication devices into the helmet’s neck roll or shell. How the face shield is removed falls within this category. Some face shields can be removed in seconds without tools, others require far more labor and hassle. 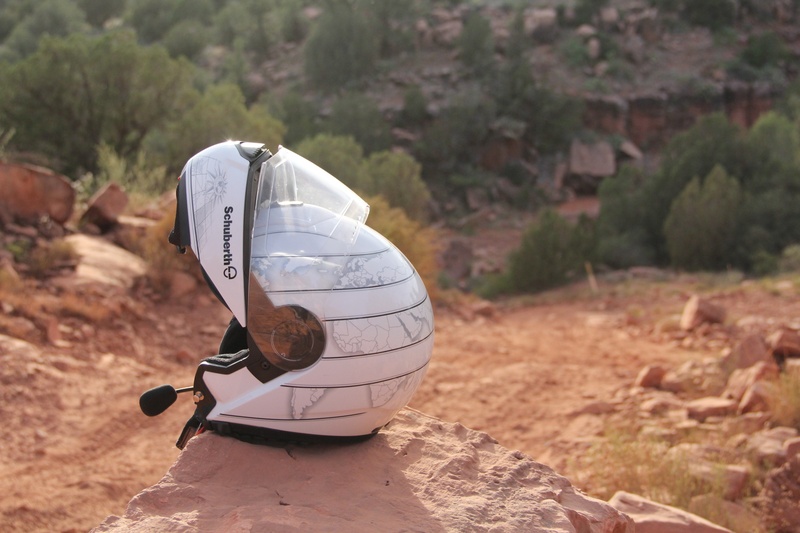 Schuberth’s C3-Pro is fitted with an internal antenna to bolster the performance of the optional Bluetooth communicator which fits in the neck roll as to not disrupt aerodynamics. Like all things, the more you pay, the better the return––hopefully. Lesser expensive helmets will typically use lesser expensive materials. This can translate to a helmet that is heavier and maybe not as comfortable. The face shield may have more optical distortion and in general the helmet may not hold up to daily wear and tear as well as a nicer version. If you’ve done your homework and found the perfect helmet for your needs, it will be light on your head, fit well with no pressure points, and include all of the features you decided you desired. 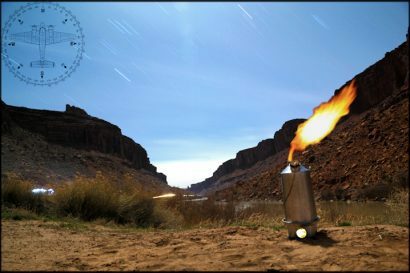 It will slice through the air at speed with no buffeting or drag, be quiet as a church, and flow air for optimal comfort and moisture control. The face shield will offer good optical clarity and the internal elements will not chafe or agitate your face or head. It may come at a premium to find a helmet that ticks all the boxes but it will be worth it in the end, particularly if it truly gets put to use for its intended purpose. Finding the best helmet for your head will take time and research. If you can, demo a helmet before you buy it. The proof of performance is best attained on the road and trail. How long does a helmet last? This too is a topic with much conjecture and dissent. 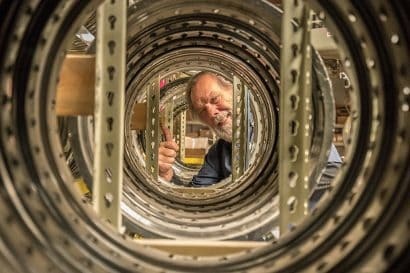 Most manufacturers will say their helmets are built with a projected five year service life. Naturally, even a minor crash should be enough to warrant a helmet’s retirement, and many manufactures offer reduced crash replacement prices for those scenarios. For helmets not suffering actual impact, they do degrade with time. The internal foam structures are susceptible to degradation via exposure to fuel fumes and seemingly mild offenses like being perched on your mirrors every time you park your machine. As you can imagine, many riders use their helmets well beyond that five year mark, and that is a personal choice. Many of the experts suggest storing your helmet away from fuel and in a closet with more regulated temperatures. Don’t hang it on your mirror or slung next to the hot engine on the motorcycle when you park. Don’t wash it with harsh cleaners, particularly the inside of the helmet, and treat it with the tenderness you reserve for your own skull.